Union Public Services Commission (UPSC) of India has declared the Civil Services (Main) Examination 2011 results. A total number of 910 candidates have been recommended for appointment including 420 General (including 21 Physically Challenged candidates), 255 Other Backward Classes (including 8 Physically Challenged candidates), 157 Scheduled Castes (including 4 Physically Challenged candidate) and 78 Scheduled Tribes candidates. This result is making appointment to below posts. (iv) Central Services, Group ‘A’ and Group ‘B’. The Indian Civil Service serves as the backbone of India and carries great respect and responsibilities. India's best brains strive for entry into the Indian Civil Services as IAS, IFS or IPS officers. Even though corporate jobs offer the best of salaries and perks, a majority of youngsters and their parents still want an entry to the prestigious Indian Civil Services held by the UPSC (Union Public Service Commission). Find below the list of Toppers. You can see the complete list here. Woman Candidate Shena Aggarwal (Roll No. 233541) has secured the First Rank in the Civil Servcies Main Exam. 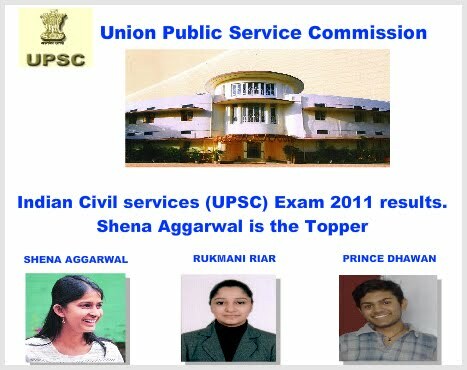 Previous year (2010 UPSE Exam) also Women take top ranks. Shena Aggarwal is from Yamunanagar, Haryana. She is the Daughter of Dr. C K Gupta and Pinky Aggarwal. Shena Aggarwal was the All India topper of CBSE PMT exam 2004. Shena got 305th rank in 2010 Civil Service Exam. Shena Aggarwal had done MBBS from All India Institute of Medical Sciences, Delhi. The 2nd ranker is Rukmani Riar has done Master of Arts (Social Entrepreneurship) from Tata Institute of Social Sciences, Mumbai. And the 3rd Ranker Prince Dhawan had completed M. Tech (Elect. Engg) from IIT, Delhi . A record number of 472290 candidates applied for the preliminary examination. And only 243003 candidates actually appeared for the preliminary Exam. 11984 candidates were declared qualified for the Main written examination held in October-November, 2011 out of which 2417 candidates were selected for the Personality Test conducted in March-April, 2012. Finally, 910 candidates (715 male & 195 female) were recommended for appointment to the IAS, IFS, IPS and other Central Services against 1001 reported vacancies.